A massive water salute erupted in New York Harbor, as the newest FDNY fireboat arrived just after 3pm today. She is named after Firefighter William M. Feehan who died in the 9/11 attacks. The name plates with red letters crafted from I-beam steel collected at ground zero are displayed on each side of the wheelhouse. Her 66-foot aluminum hull houses three C-18 Caterpillar engines for propulsion, delivering 1150HP each. Another 450HP Caterpillar C-9 engine drives the water pumps, and for additional pumping power, one of the main C-18 engines can be assigned to the main water canon. She delivers up to 7,000 gallons of seawater per minute and foam and purple-K additives are also on board if needed. Her crew of five firemen consists of a pilot, an engineer, an officer and two deckhands -- safely housed inside the positive-pressure CBRNE (Chemical, Biological, Radiological, Nuclear and Explosives) filtration system equipped bridge. The $4.7-million medium-sized fast-response boat built by MetalCraft Marine in Kingston, Canada will be stationed at MARINE 6 in the East River, at the Brooklyn Navy Yard. At 11 times the size of a full-grown blue whale, Royal Caribbean’s ‘Quantum of the Seas‘ sailed into New York Harbor for the first time this morning, completing her maiden trans-Atlantic voyage. Once past the Verrazano Narrows Bridge, the ‘North Star‘ glass capsule was raised on her top deck, providing passengers with a 360-degree view extending to the same height as the torch of the Statue of Liberty. Complete with robotic bartenders, bumper cars, a FlowRider surf and RipCord iFlyskydiving simulator, she also features 375 interior staterooms with virtual balconies, projecting real-time views of the ocean. Wifi and RFID luggage tags allow guests to track their bags right from a smartphone. 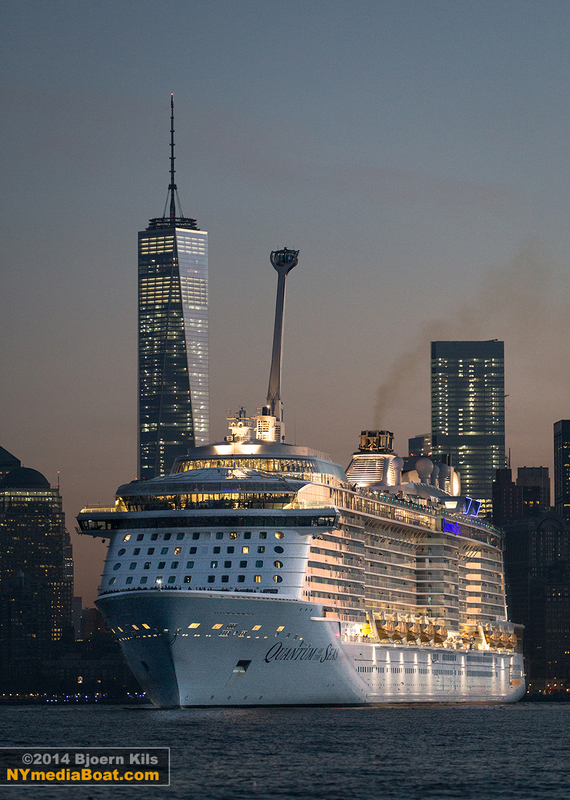 At 1,141 feet long, ‘Quantum of the Seas’ is now the largest cruise-ship on the Hudson River, a status previously held by Norwegian Cruise Line’s 1,068-foot ‘Norwegian Breakaway‘. Her homeport is the Cape Liberty Cruise Port in Bayonne, New Jersey and she’ll be christened there later this week. 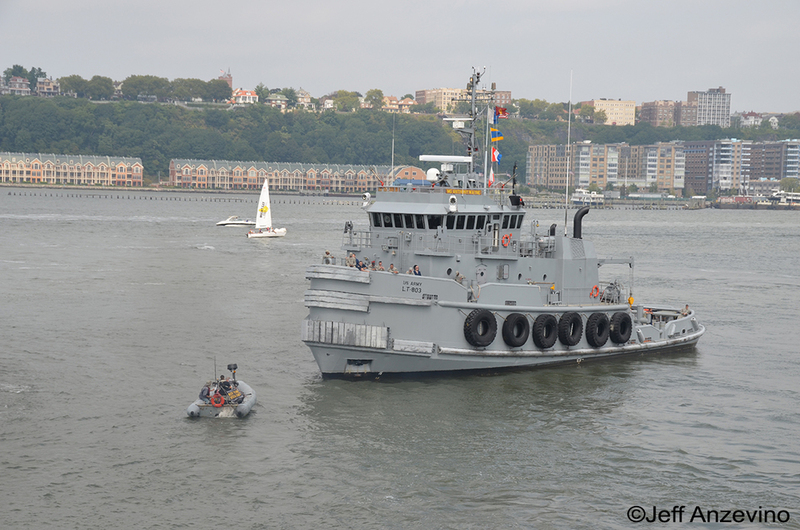 The tugs raced and pushed on the Hudson, and the crews had spinach eating, tattoo and line throwing contests. Besides the regular harbor tugs, the ship that brought the biggest guns to the show was the US ARMY LT-803 Major General Anthony Wayne. She took second in the race, but sure dominated the nose-to-nose pushing competition with her twin 11-foot diameter screws. … as the skipper accepted our nose-to-nose challenge. For additional write-ups of this event — and cool stuff in general — check these awesome blogs! 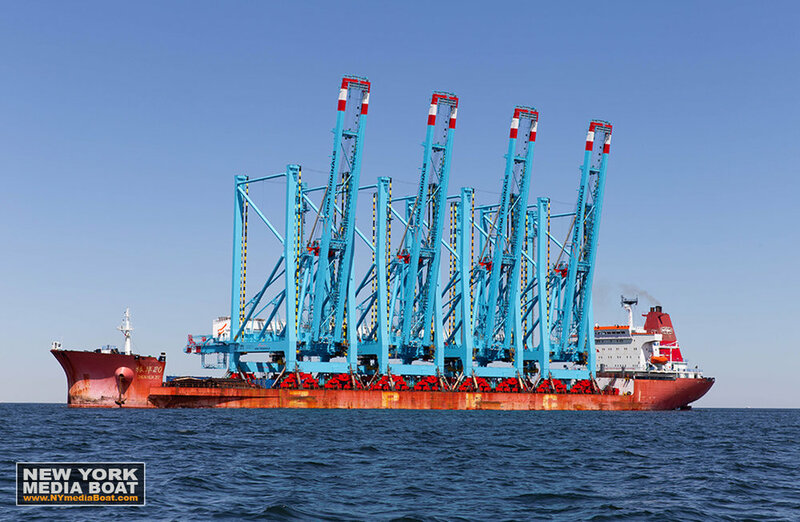 The Port Newark Container Terminal is increasing capacity by taking delivery of three ZMPC Super-Post-Panamax ship-to-shore cranes as part of their $500 million dollar expansion project. 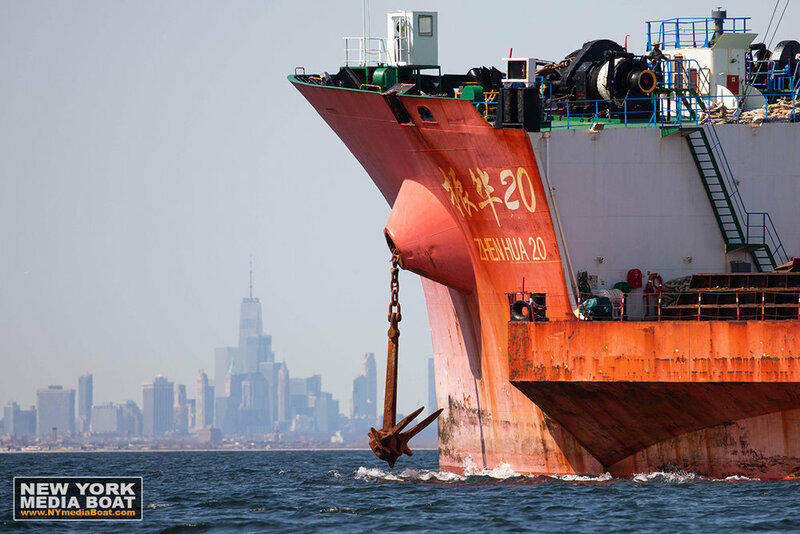 After a 13-week journey from Shanghai, the Chinese heavy load carrier ‘Zhen Hua 10’ is delivering the cranes, requiring expert navigation by the Sandy Hook Pilots and Metro Pilots, while entering the port, passing under the Verrazano-Narrows and the Bayonne Bridge. The cranes will take about nine days to unload and three months to assemble. They can reach 22 rows of containers across the deck of a ship. 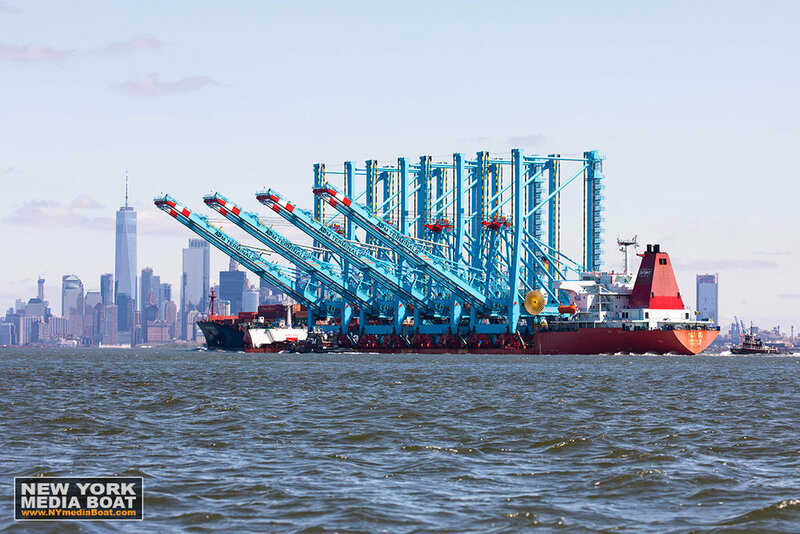 The raising of the Bayonne Bridge and acquisition of these cranes enable Port Newark to accommodate the new fleet of supercargo ships. “We went to Pathmark and bought enough food and beer to get us there and back,” Eneberg said. In 2012, Vaerbitt was sailed by her previous owner from Norway via Spain and the Canary Islands to Saint Lucia and Panama before arriving in New York Harbor. She was put up for sale and Eneberg purchased her with the intent to sail her back to Norway. “We won’t take the northern route because of the ice, and we will head straight for the Azores,” he said. 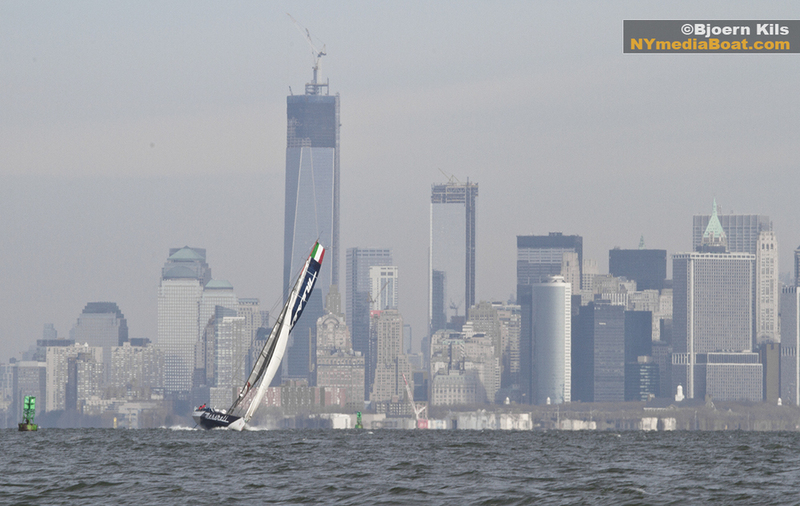 Clearing U.S. Customs and donning New York Media Boat swag, the team departed Liberty Landing Marina in New Jersey at 18:00 ET, hoisted sail, and set course due east. The crew was looking forward to reaching international waters and exchanging their guest flag for a jolly roger. More info on the boat, the voyage, and daily position reports at www.vaerbitt.net. 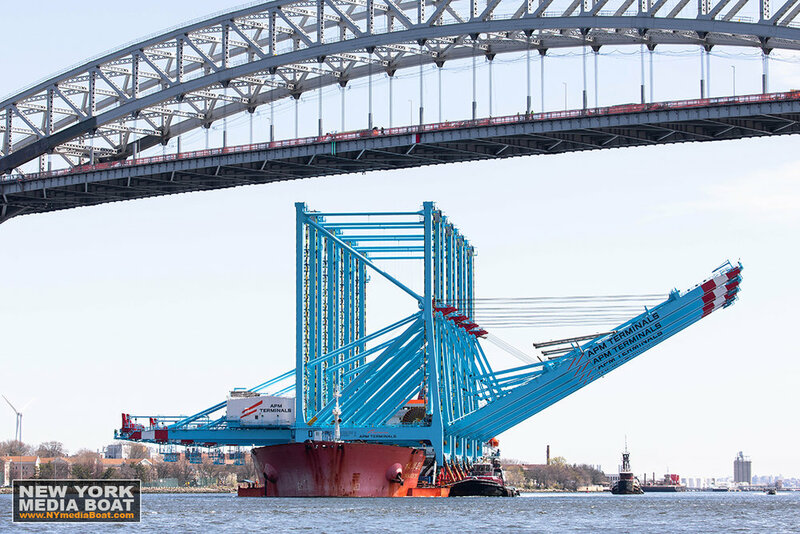 After a 6,000 mile tow, the ‘Left Coast Lifter’ mega-crane arrives in New York Harbor. The 150-foot ocean going tug ‘Lauren Foss’, powered by twin diesels producing 8,200 horsepower, completed the move of the crane after leaving San Francisco less than six weeks ago. The voyage took them down the West Coast, through the Panama Canal and up the East Coast to New York. The convoy of tug, barge, plus support vessel ‘Iver Foss’ passed under the Verrazano Bridge around 10 am this morning and is now docked in Bayonne, NJ. 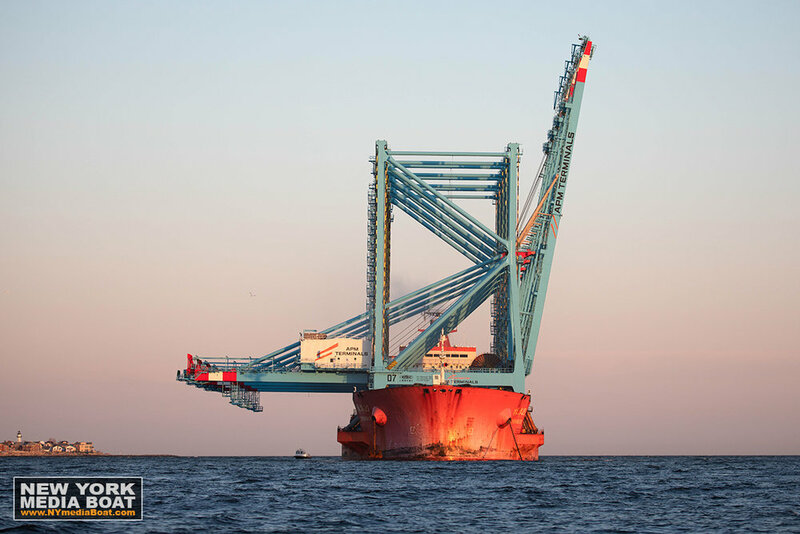 The ‘Left Coast Lifter’ was previously used on the San Francisco – Oakland Bay Bridge project and will now assist with construction on the Tappan Zee and New New York Bridge. Over the summer, we spent a day at sea with the Sandy Hook Pilots on assignment for New Jersey Monthly. We watched them scale the Jacob’s ladders of giant oil tankers and container ships to steer these behemoths safely into port. We’d ride with the launch back and forth between ships, picking up pilots and dropping them off. It was a gorgeous day, and could easily make you think the pilot’s life is for you. But change the setting to a freezing winter day with seas kicked up ahead of a nor’easter, and you start having second thoughts. The transfer from the launch to the ladder of a 1,000-foot container ship turns from a fun leap into one of life-or-death: it has to be timed precisely, lest you fall in the drink or get squeezed between two vessels. That’s why Pilot personalities are the perfect blend of adventurous and competent. These guys have the responsibility of ensuring that billions of dollars’ worth of global trade arrives to final destinations in the ports of New York and New Jersey. Check out the full Sandy Hook Pilots article and photo essay in the December issue ofNew Jersey Monthly — now on newsstands — or read it here at this link. Lots happening on the Hudson during this incredible extended summer — including stunning, contrasting examples of power. On a recent photo excursion, we spotted the tail section of a submarine, possibly on its way to the NAVY shipyard in Groton, Connecticut. Will it be a ballistic missile sub, or an attack sub? 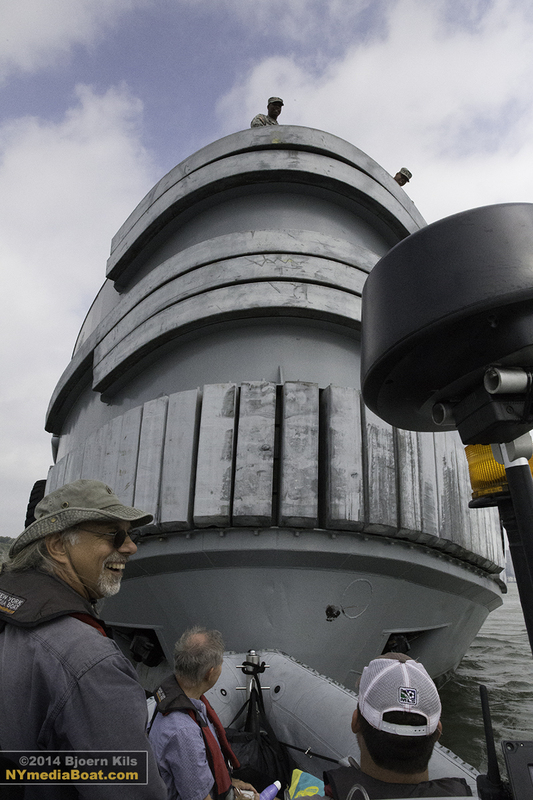 Check out this piece from Undersea Warfare on how they put one of these together. A little less intimidating — but no less exciting — was a visit from the BayCycle Project. Founder Judah Schiller straps two pontoons to his bike, which powers a propeller and pushes him across the water. In late September, he became the first person to bike across the San Francisco Bay, and last week, the first to pedal across the Hudson — without the help of a bridge, of course. Nearly all U.S. submarines are nuclear powered. Schiller runs on elbow (knee?) grease. Quite the contrast of high-tech versus low-tech power. NEW YORK, June 18, 2013 — I got to sail a portion of the Gulf Stream aboard VO70 ‘Maserati’ from Charleston, SC to New York last winter. We took advantage of it’s 5 mile per hour northward flow and mild temperatures. Entering the stream, foulies and boots were quickly exchanged for t-shirts and flip flops. The Gulf Stream gyres in the North Atlantic, transporting warm nutrient rich water from the tropics along the East Coast of the U.S. towards Europe. Eventually the water cools, becomes denser, sinks and starts flowing south as part of the North Atlantic Deep Water before resurfacing off Florida. Some speculate that without the warm influence of the Gulf Stream North America and Europe would look more like Alaska – snowy tundras and vast ice fields. Scientist from the University of Geneva are now taking a closer look at this 60 mile wide current that extends as far as 4000ft deep. Climatologist Martin Beniston leads the DEEPWATER EXPEDITION joining the crew of the swiss catamaran ‘MS Turanor Planet Solar’ — the largest solar powered ship in the world — on her voyage from Miami to Bergen, Norway with stops in New York, Boston, St-John’s and Reykjavik. Beniston deems the 82ft long vessel a suitable platform for scientific sampling. No gasoline or diesel are used for propulsion and voyages are made with zero CO2 emission, eliminating potential factors of data pollution. He and his team are studying the chemical and physical composition of water masses and aerosols. New York Media Boat spoke with Deepwater Expedition team member Dr. Bastiaan Ibelings, a professor in microbial ecology at the University of Geneva who explains the importance of phytoplankton for our oceans and climate. The 82 foot long ‘MS Turanor PlanetSolar’ is part of a Swiss initiative to demonstrate how innovative technology can harvest renewable energy and allow clean travel. 5,500 square feet of photovoltaic cells supply power for the twin 60kW electric motors moving her averaging 5 knots. Five World Records have been established by ‘MS Turanro PlanetSolar’ including ‘first earth circumnavigation by solar-powered boat’ and ‘fastest transatlantic crossing completely under solar power’ in 26 days. Note: French sailer Francis Joyon crossed the North Atlantic in just over 5 days powered by wind earlier this week. Be sure to stop by the boat currently docked at North Cove Marina before she leaves on Thursday for Boston. A few days ago we showed you one of the world’s most decked-out private yachts —the $1.5 billion Eclipse. Today, on the other side of the spectrum but just a few miles south on the Hudson, floats the world’s most primitive seagoing raft — the Tangaroa. From a distance, it appears to be Thor Heyerdahl’s Kon-Tiki built by the Norwegian explorer to show that people from South America could have settled Polynesia from the east, contrary to popular belief. They constructed Kon-Tiki from balsa wood and hemp rope — the same materials available before Columbus’ time. Heyerdahl and his crew navigated by the stars and ocean currents, and put down some respectable 4,300 nautical miles before wrecking Kon-Tiki on a reef in theTuamotu Islands after 101 days at sea. Heyerdahl’s 1947 expedition across the Pacific was a huge success: it made him Norway’s most famous person, his book became an international best seller, and their documentary won an Academy Award in 1951. The raft currently docked at North Cove Marina is a replica and did not sail from Norway to New York, but was delivered by container ship instead. It’s here as a promotional stunt to highlight the newly released 2012 action movie ‘Kon-Tiki,’ nominated for a 2013 ‘Best Foreign Language Film’ Oscar. Tangaroa however was not built to promote the movie, but rather float the Humbold Current as well. In 2006 a Norwegian team led by Olav Heyerdahl, grandson of Thor Heyerdahl, constructed the replica-raft in an attempt to duplicate the original Kon-Tikivoyage. They too crossed the Pacific, made landfall in the Polynesian Islands, anddocumented their voyage. If you want to climb aboard Tangaroa, swing by North Cove Marina in Battery Park City. I’m told the raft is open to the public and will be there until April 22nd. The movie opens in select U.S. theaters on April 26 so check out the trailer, and if you’re ever in Oslo, I highly recommend a visit to the Kon-Tiki Museum at Bygdøy. We almost caught a glimpse of the world’s largest private yacht, but we were a day late. Russian oligarch Roman Abramovich’s 536-foot Eclipse had just been eclipsed by a new addition to the Saudi royal family’s fleet: the 590-foot Azzam launched in Germany late last week. Even though it was now only the world’s second largest private yacht, Eclipse was an impressive sight from just outside the 100-yard security perimeter. She needed a berth usually reserved for major cruise liners. Her main antenna, specked with half a dozen satellite domes, jutted into the skyline. Her six decks looked as if they could fold down into one giant floating Matryoshka doll. Somewhere on board this behemoth, reportedly, there’s a submarine, a disco, a movie theater, two swimming pools, two helipads, and likely more secondary vessels than former soviet leaders. She’s even rumored to have a missile defense system – and lasers to disable cameras. Luckily, we couldn’t confirm either of those things. Word is that the $1.5 billion Eclipse will be in New York until mid-April, when Abramovich’s girlfriend is expected to give birth to their child. After that, she’ll likely bebattling with the $600 million Azzam over Caribbean anchorages. After successfully relaunching ‘Aperture’ at Liberty Harbor, we got right back to business. CNN put a TV crew on board to get exclusive footage of the devastation Hurricane Sandy caused to Coney Island, the Rockaways and Staten Island. Maneuvering through the floating debris was challenging despite having stationed a spotter at the bow, dodging telephone poles, trees, logs, even partial docks that were making their way down the Hudson. Norton Point was hit hard. The ocean literally came into peoples living rooms and many houses were simply gone. The Rockaways were still smoldering from the extensive fires; Old Orchard Lighthouse knocked down, and many half-sunken boats adrift in the Lower Bay, and washed ashore at Staten Island and Sandy Hook. Atlantic Highlands Marina didn’t fare well. We observed dive teams from as far away as Texas working around the clock raising sunken vessels with lift bags, and clearing paths for the commuter ferries to resume service. USCG cutters and NAVY ships were stationed just offshore, providing security and other support functions to the hard-hit communities. 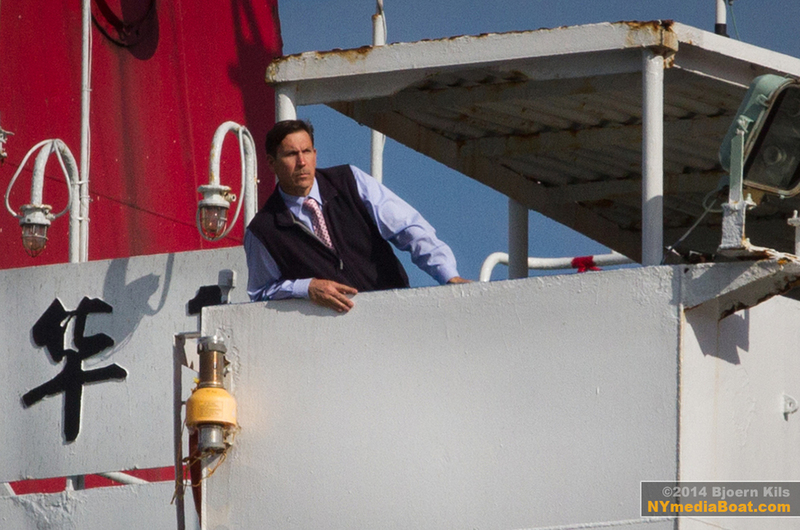 The port condition was set at YANKEE – restricting all recreational boats and only permitting commercial vessels to transit. Great Kills Harbor was a sad sight as well. It seemed like a total loss of the marina. While some boats turtled and sunk at their moorings, most were piled on top of each other at the western side of the basin — many impaled by pilings as the water from the 13.8 foot storm surge receded. Other TV crews and still photographers also came aboard that week following Sandy’s landfall and we were able to document the destruction before NYPD stationed a patrol boat at the entrance closing the marina. We put down hundreds of nautical miles surveying the shorelines, and whenever we came across floating debris dangerous to navigation we reported it’s position to the Coast Guard’s VTS. This sure was an epic storm.